It’s Littlerbit, the Booper Trooper! I live! Honest! And #2 has shown up finally. She was born here at home on the morning of the 16th, but I’ve been busy with her, and her big sister, and catching up a few people here and there on assorted and sundry life. And yes — she. 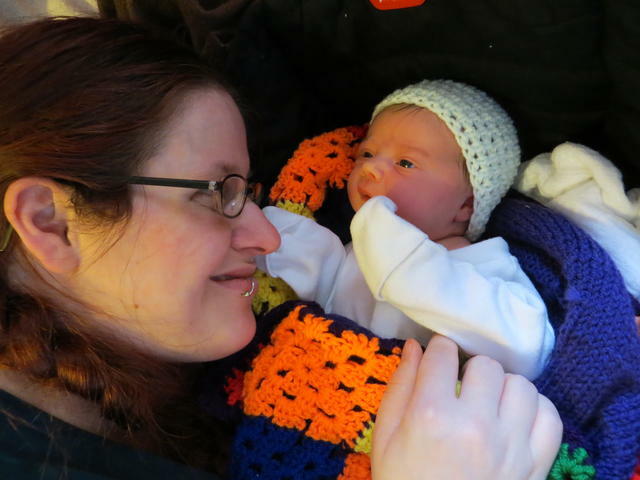 It was our understanding that we were expecting another girl, but as you never know until you’re handed the baby, we preferred to not fully presume. I did feel it was a girl though, especially based on how extra-severe my chronic fatigue, nausea, and other such endometriosis-related symptoms seemed to be persisting. I figured — if it’s a girl, then that would mean more estrogen and other female hormones, and that could be making it super-crap. I have to say, I am doing a LOT better this postpartum so far. Besides being in less pain and fatigue from a significantly shorter labour (when baby came, she came with all alacrity and speed, and like, 20 minutes of pushing), my base mood is a lot better ’cause yanno, turned the difficulty level down. I’m not breastfeeding this time because I’d much rather take my psych meds and be a sane mommy, and that also means I can take codeine for the assorted pain. And yes, my Seroquel and I are reunited at last! I started with 50mg on the 16th, and am ramping that up by 50mg until I return to my previous dose of 400mg (200mg twice a day). I was up half that first night with my husband, because yanno, dealing with a person who doesn’t speak our language and doesn’t know how to communicate well, so we were both trying to support each other in sleeping and taking care of Littlerbit. I got to sleep the night through last night though, and oh.my.stars. I’m still way sore and exhausted (as can be expected), but I feel really freaking human and happy and stable. And I can see how me being calm and happy is making for a calmer, happier baby. Funny how not having to use all your energy being scared of narcissist bullhonky frees up significant spoons, and the ability to have one’s guard down and *gasp* relax and enjoy the ride! Mind, I’m certainly wary of the possibility of postpartum depression atop the bipolar, or worse, postpartum psychosis. But I think that because I am able to be more honest with myself about my mood and state gives me a much better chance of avoiding these things, and if they do crop up, dealing with them. CONGRATULATIONS!!!!!! 🙂 Littlerbit is ADORABLE, and I’m so happy she’s here and you were able to get back on your meds. I think you’ll do fine postpartum, just make sure to monitor your mood and yes, expect the hormonal shifts to affect you at least a little. Welcome to the world, little one!!! Oh yes, I did mention the gallery, but not the link. It’s at http://www.zaxxonwyzad.com/pictures/main.php?g2_itemId=18 if you wanted to nose about family photos, hee hee. All the current ones are, of course, in the 2014 sub-album. The husband just reorganized it in the hopes it would quit buckling under its own weight. I love this picture of you and the tiny one. So adorable!